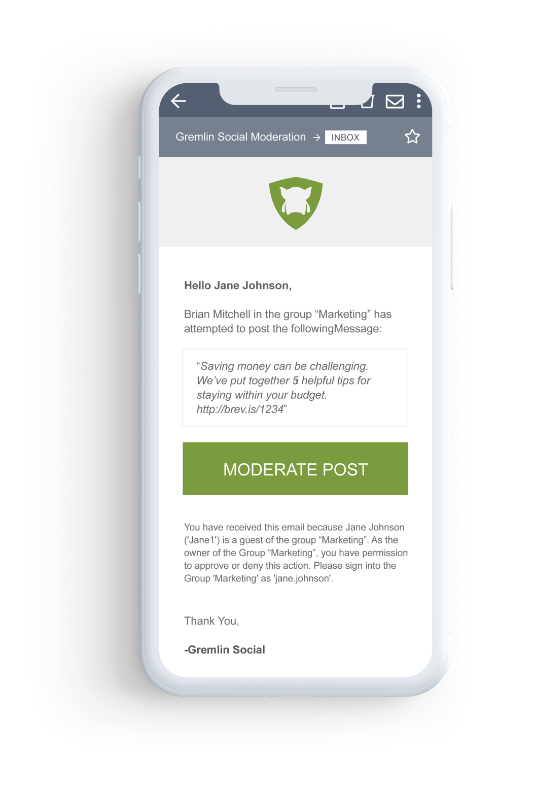 Prevent non-compliant social media posts with keyword/phrase filtering, archive web and social media activity and manage approval processes with Gremlin Social Guardian, endorsed by the American Bankers Association for social media management and compliance. Avoid violating regulations by preventing certain content from being used in corporate posts with keyword/phrase filtering. Already have a list of words and phrases that you’re monitoring for email? With a click of a button, Gremlin social media compliance software uploads files containing any number of words you’d like to filter and monitor. Organize your teams to match your corporate structure and set up compliance filtering to match the job function of each team. Your posts do not get sent until your approval process is fully executed. Capture and archive messages and activity from Facebook, LinkedIn and Twitter. All data is searchable and exportable for reporting or audit purposes.